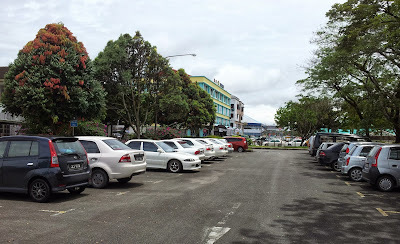 the Bintulu District Council ( thus the name BDC library) The BDC building is seen at left in the background. The pic above is taken in early 1980's when the library was run by the Bintulu Development Authoruty (BDA) staff and funds. The former site of the library is turned into a car parking area. Pic taken on 19 September, 2013. In the 1960's when Bintulu was a very small town, it had one public library located at the Bintulu Recreation Centre (BRC). The library occupied a small space at the back of the BRC building. In 1971 the local authority of Bintulu called the Bintulu District Council had sufficient funds to building a separate building as a public library. The very top picture shows the BDC public library. In Bintulu town there was another small building run by the Council called the 'Reading Room' at Kampung Sinong to cater for the reading needs of the predominantly Melanau villagers of Kampung Dagang to Kampung Sebiew. In 1978 the Bintulu Development Authority (BDA) was formed. The BDA took over the library when the BDC was absorbed into BDA because the BDA's functions included municipal or local authority functions besides a planning and development agency for the Bintulu region or division. The library was subsequently re-named BDA Public Library or "Perpustakaan Awam BDA" in Malay. Soon after BDA's taking over of the library, the library was provided with air-conditoning amenities. In 1988 the library was demolished to make way for a public car parking area as in the bottom picture above. In 1988 the library was run by 8 staff and had about 20,000 book titles in various languages. Upon demolishing the library was moved to the first floor of the former BDC building. It remained at the BDC old building till 2001. However, in 2002 the library was moved out of the old building to a new permanent, bigger and more modern public library situated near to the 'Dewan Suarah' about 2 kilometers away from the town.